During the September long weekend CARA will be accepting payment for the 2018 membership year. All memberships purchased during this time are valid until December 2018. At the 2014 AGM the vote was unanimous to increase membership fees from $30 to $40 per membership. This is the first increase of membership fees since the clubs inception on 2006. The Calgary ATV Riders had representatives took part in Public Consultation Workshops earlier this year in regards to the development of the South Saskatchewan Regional Plan, which would be set out to regulate various land use in the region including that for OHV use. Following three phases of consultation from November 2009 to February 2014, the Government of Alberta has released the South Saskatchewan Regional Plan. 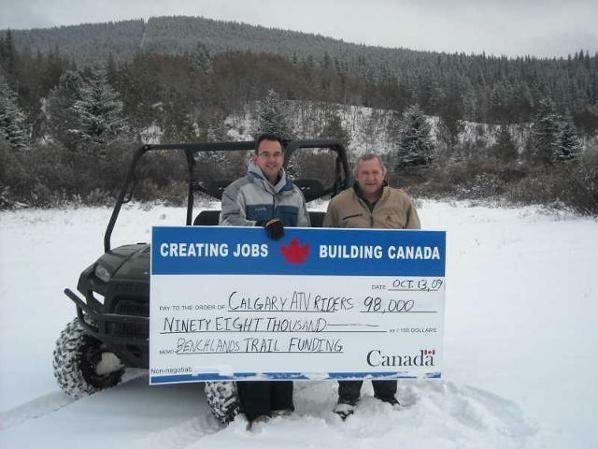 We are proud to announce that the Calgary ATV Riders Association was recently awarded a $98,000 matching grant from the National Trails Coalition (NTC) Infrastructure Program, a key partner in Canada’s Economic Action Plan. The grant was matched with another $98K of confirmed donated funding from the Provincial/Federal MLAs, AOHVA and from other specialty donated services. That totals $196,000 in funding for the Ghost area trail system. The funding is intended to complete trail maintenance and modular bridge installations east of the Fallen Timber PRA in the Ghost FLUZ, which is NW of Cochrane. Work must be completed over the next ~8 months. Our Stewardship Coordinator and vice-President, Garry Salekin will be coordinating the club's efforts to meet the grant requirements. Great effort by Garry to secure this trail maintenance funding. This is in addition to the continual ATV bridge installations, trail maintenance activities, organized rides/events, trade-show representation and back-country first-aid training that the club is involved in. The Calgary ATV Riders stewardship coordinator Garry Salekin has completed about 40+km of trail work with respect to this grant. Some was in the SE quadrant near WP#'s 117-115 (East of Airstrip), 109-111 (Cow Lake), 117-109 (South of Airstrip), 97-73 (SE of Waiparous campground). Additional work was performed west of the Fallen Timber PRA, WP# 193>389>387>385>375>373 (although NOT all inclusive). He has also completed the five additional CARA ATV bridge installs in that approximate area. Including a hurdle of a second theft of bridge installation lumber after the helicopter drop in Sept.
Garry met with the local MP in the photo and Cochrane/Ottawa newspaper reporters reviewing the excellent work and jobs that were created from this grant. Hopefully next year we will receive even greater funding and be able to further contribute to the much needed maintenance and development of the Ghost PLUZ area. Another reason to support your local clubs and organizations who work to keep you riding by building bridges, not fences to keep you out!